"Devil Mountain Muay Thai Battle Series I"
IKF Locker Room Inspector: Chris Fields, Victor Zaragoza, Jesse Pineda & Rob Cahoon. Mike Rossi came it at 168 lbs and had to lose to 167. Colin Stratford came it at 167 lbs and had to lose to 165. Andrew Trac was issued a 180 day no training and 180 day no competition medical suspension until June 2nd, 2016 by Dr. Audrey Konow. Complained of pain in Left Foot. Can be cleared by MD prior to June 2nd, 2016. 12-10-15: Andrew Trac was cleared by CSAC Dr. Gary Furness today after being seen in his office. All medical suspensions have been lifted. Judge Bruce Rasmussen: 29-28 Vilela. Judge Susan Thomas-Gitlin: 30-27 Vilela. Judge Michael Rinaldi: 29-28 Cervantes. VS by TKO at 1:09 of Round 3. Juan Rodriguez was issued a 30 day no training and 45 day no competition medical suspension until January 19th, 2016 by Dr. Gary Furness. Tarik Mathews came it at 154.5 lbs and had to lose to 152.
defeated *rn*Mario Banks (San Francisco, California, USA, 1-1/1, 166, 5'9", 10-19-87, Jongsanan, (415) 516-6224, - (FP: 12-5-15) - (RN: 12-5-16) - (LU: 12-5-15)) by **Technical Forfeit when Banks pulled out of the bout just hours before the fight due to sickness. (**) No win or loss was added to either fighters record. 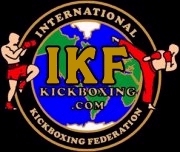 Mario Banks was issued a 30 day no training and 45 day no competition medical suspension until January 19th, 2016 by the IKF. Mario Banks came it at 167 lbs at weigh-ins and had to lose to 166. Judge Bruce Rasmussen: 30-27 McNutt. Judge Michael Rinaldi: 29-28 McNutt. Judge Susan Thomas-Gitlin: 29-28 Hernandez. Judge Michael Rinaldi: 29-28 Aguaristi.